My daughter Alexandria's best friend, Tina, is on the JV Pom Squad at school. Amy--Tina's mom, asked if I could help her with a project for the girls on the Squad for Christmas presents. She had purchased some glass vases and asked if I could help her do some glass etching. 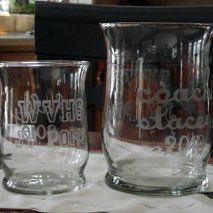 I forgot to take pictures when I was making the stencils and putting them on the vases. I made 15 for her. Each has the girls name and date on one side and WVHS JV Poms on the other side. I made the file for the stencils in my Gypsy welding together the girls names and cut them out with vinyl. I put the vinyl on the vases for her which is a little tedious for someone who isn't used to working with vinyl and Cricut cuts. I wrote up some directions for her and had her do the glass etching herself. She sent me the pictures below today to show me how they turned out. She is going to fill them with candy and give them to the girls for Christmas. I love this, I bet the pom squad does too. Nice job. Those are very pretty. The girls will love them. What kind of candy will go in them? LOL just kidding!! And the three cards you did for the copic lunch, I liked them. The three singing mice was my fav. Take care.